Debra's thoughts on Oracle: My EMEA Short Talk - WhichInstance? My EMEA Short Talk - WhichInstance? 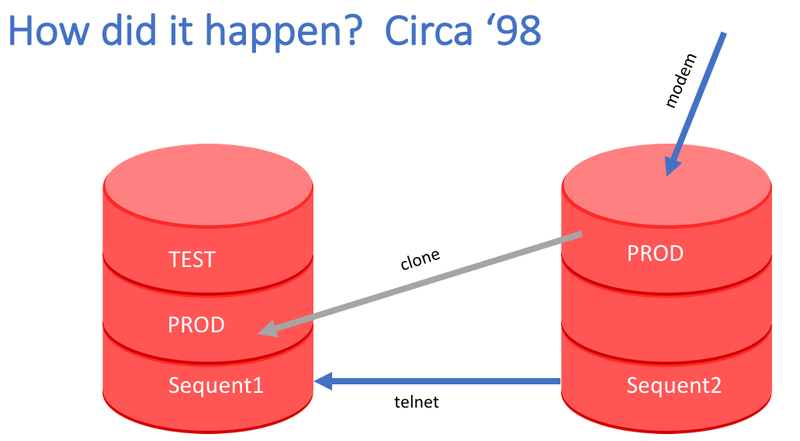 My contribution to the EMEA ACEs Short Talks is a very old story and could be about the time I stopped being Technical. We are taking almost 20 years ago when I was an E Business Suite Support manager in Fujitsu. A customer had a problem where one off payments were not generating cheques (that is the correct English spelling of check). Despite raising a TAR (the old word for SR, a Technical Assistance Request) with Oracle, we had not found the answer. I was unable to replicate in the test system so the DBA created me a clone so I could play investigate in the system safely. I dialled in (yep the story is that old), which connected me to the live instance which resided on sequent1 (sequent used to be Oracle hardware of choice). Then I had to 'telnet' to sequent 2 where the clone was hosted. I worked on the problem for many hours and then had a breakthrough, the error was in a setting in a profile option (as far as I remember, the error is not really important to the story). I created a new file with a one off payment and ran it through the system from start to finish. Brilliant it all worked. I disconnected and went off to bed believing I had great news to share with the customer Monday morning. Not quite what happened though, the customer rang me to say I had successfully tested their fraud procedure and they had found the payment I had made myself and the cheque had been destroyed and not posted. I was horrified, I had created a cheque or myself in Production!!!!!!! What happened was I had dialled into sequent1 but failed to telnet successfully to sequet2. I didn't realise because as the DBA had not renamed the clone (why did he need to, they were on separate machines?). So I wasn't in the clones Live, I was in the 'live' live. I had fixed the problem and generated a one off payment to myself. I was begging to panic as to what this would result in. A complaint or even loosing my job, but the customer laughed and said it was obviously a well intentioned error. If I was really going to defraud them I would have made the payment for more than £100!